Okay right off the bat my favorite part of this game — introduced to me by my lovely roommates — is the customization feature. There’s nothing more enjoyable than sitting around your living room with a group of friends dissecting each part of your physical structure and modeling it back into the game itself creating a game version of yourself. But badass and with big ridiculous weapons and in cool fantasy clothing. Seriously look at how awesome I look. I am super cute. I’m working that red bow. It can get a little scary just how much detail you can put into your character. Skin tone, hair and eye color are all pretty basic nowadays, but Dynasty allows you to change how big and thin your face it. How wide and short your nose is, how far apart your eyes are. Even their position on your face. The only minor hiccup I had was that body types are very limited for both men and women. There aren’t large or chunky people in this game, which I found a bit bothersome. There are two main modes that I played, Empire and Free Mode. Free Mode is broken down into Invasions, Defensive Battles, Event Battles, and Quests. Invasions is where your characters fight someone else, Defensive Battles is where someone is fighting you with a time limit you have to beat. Then you have Event Battles that are storyline based missions that you can unlock in the Empire mode. Finally there’s Quests that are tailored to specific characters focusing on smaller side stories like slaying wolves. I played mainly in Invasion mode which gives you a battle map, and the objective of the invasion itself. Everything is customizable from the weapons your characters — or officers as they’re referred to in game — have and so forth. The game is a ton of fun. You can go through Free Mode basically hacking and slashing your way through opponents just to get a feel for the game play. Or if you prefer the strategic route you can go through Empire Mode and work your way through the political steps of conquering China. I preferred Free Mode; hack and slash being more my style. I’m one of those button smashers pressing square-triangle-square-square in rapid succession watching what random attacks my tiny character can do. It’s ridiculous, but that mode was super fun for a newbie like me. Empire Mode is way more complicated, with a set of stats, a specific part of the country to begin your war campaign in, and even different political routes you can take depending on what your own individual style is. You can be an ally to another in-game leader, join said in-game leader and then rebel, or start off completely on your own. You can customize everything, and I mean everything. From what your house looks like, to your audience chamber, soldiers, war horse, even background music. The main objective of Empire Mode is to take over China. You do this by conquering different parts of the country one section at a time, but also by building relationships with fellow rulers. It’s a two-sided coin that requires a lot of strategic thinking. That’s where the game gets a little boring for me. There’s not a lot of actual story to going on dispute the fact you have to build relationships with fellow characters. Everything is done off-screen or through a handful of cut scenes that you get when you build relationships with other characters. It’s fun to marry, or form brotherhood friendships with your fellow players, but after that the shine fades pretty quickly. The game isn’t overly difficult to beat and once you do you basically do everything all over again. So the replay ability of the game isn’t that great. Also it’s not dubbed, there are English subtitles but that’s about it. It’s strange at first, but you quickly get used to it. Given that I watch a lot of anime it didn’t bother me to read character lines, and since there’s barely any cut scenes dialogue doesn’t matter that much any way. I loved the hack and slash aspect of the game, but I wasn’t interested at all in the more complex strategic aspects of the game itself. The lack of story also disappointed me. When it comes to games, I’m an all-or-nothing sort of girl. Either give me a game with lots of storyline (Final Fantasy X is a favorite of mine) or a straight and simple fighter game (like Mortal Kombat or Soul Caliber). 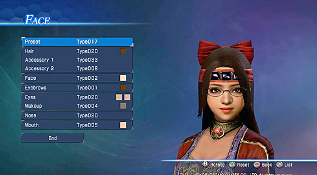 Dynasty Warriors 8 delivers on the hack and slash fighter aspect, and the customization is brilliant. I want to test future hairstyles on my character for my next haircut.